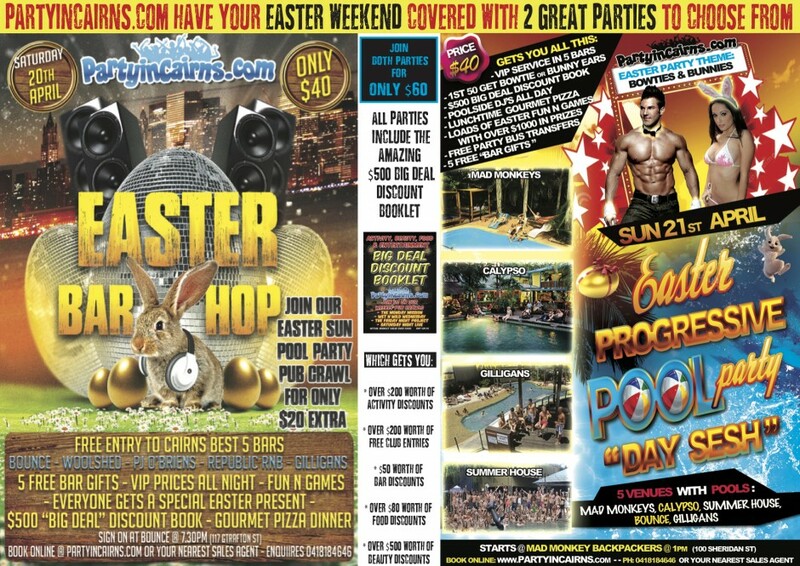 Partyincairns.com has all your Easter long weekend party needs covered this year with 2 awesome parties to choose from. Because nothing opens on Easter Friday (all bars are closed) we are running a very special Easter Saturday Pub Crawl which will be massive. So come join the party crew from partyincairns.com as they take you around all of the best bars & clubs in Cairns on Easter Saturday night. Starting at Cairns’ newest cool bar Bounce between 7.30pm – 8pm you get an action packed night full of fun, games & entertainment with some awesome prizes to win. The night also includes : FREE VIP entry & service in 5 bars (SAVE $40 in covers), 5 free bar gifts, Big Deal Discount Booklet (with actual real value of over $1000) and of course FREE downloadable photo’s of the night. The pub crawl takes you from Bounce to Woolshed to PJ O’Briens to Republic RnB then to Gilligans (with free entry all night if you want to revisit any of the clubs we have already been to).